We are pleased to announce that Ovidius University Annals of Chemistry was accepted to Emerging Source Citation Index by Clarivate Analytics (Thomson Reuters). The journal was founded in 1990 by the staff of Engineering Faculty from Ovidius University of Constanta, Romania; in the first number the papers being published in either Romanian or English language from all fields of engineering: chemistry, mechanical and constructions. 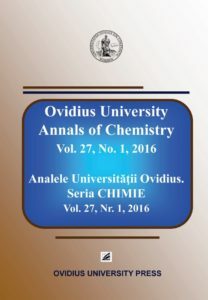 Starting from 1991 Chemistry Series have been separately edited and published in Romanian language with abstract in English, and from 1993 all the papers have been published only in English. The journal is a Category B+ journal in the CNCSIS classification. Starting from 2008 the journal has been evaluated and found suitable for coverage in Chemical Abstracts, and from 2009 the journal is indexed in IndexCopernicus and the frequency is 2 issues per year from 2005.